In the distance standing high on the hilly landscape is the Jepak Tower. In the middle ground, a tug boat tows a barge loaded with logs. What excites me most is the contrasting colours of the vessel and the red drums in the foreground. 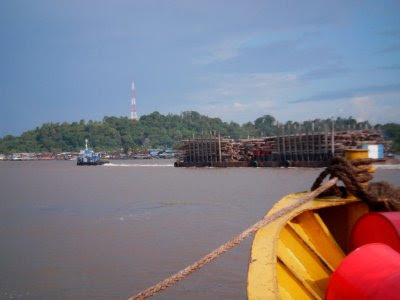 Bintulu is a real treat when it comes to see river boats, ships and tugboats. Bintulu is a timber country, before and now. Praying at Assyakirriin Mosque, Bintulu.